It’s getting harder to blame small or stuck congregations for what’s wrong with the church. There is a crisis in the church. And we want them to come back. But before we ask how to get them back, we need to ask why they’re leaving in the first place. It’s not because our churches aren’t big enough, cool enough, relevant enough, or convenient enough. Increasingly, it’s a question of character. The church’s character issues need to be addressed. Not as a means to reverse our loss of numbers. But because it’s the right thing to do, no matter what our numbers are. For many years, the biggest problem many of us have been able to see with the church is a lack of growth. And if numerical decrease is seen as the church’s biggest problem, what’s seen as the solution? Church growth, of course. Numerical congregational growth is so baked in to our expectations for church health and recovery that it’s not just expected that a healthy church will grow, it’s also assumed that a non-growing church (by Sunday morning attendance figures) is not healthy. We’ve convinced ourselves that small churches are stuck, and stuck churches are the problem. It’s getting harder to make that case any more. 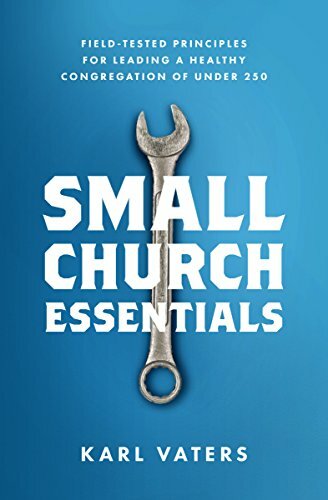 Small or stuck congregations can no longer be blamed for what’s wrong with the church. First of all, there’s a long, sad list of big- and megachurch pastors flaming out after hidden sins have been exposed. A list that seems to grow by the week. This is causing a crisis of confidence, of faith and of trust. Even though there’s no evidence to indicate that megachurch pastors have more moral failures than small church pastors do, their higher profile means a bigger negative impact. Second, there are far too many cases of the institutional church refusing to adequately address those moral failures. Not only do we not hold people accountable for their actions, we’re often covering them up, even when those actions include abuse. The biggest crisis in the church is not a loss of numbers, it’s a loss of integrity. Third, there’s a new generation (and a lot of folks in the current generation) who want nothing to do with the corporate feel of a larger church crowd. And our insistence on it is causing them to doubt our sincerity. This is not as big a problem as the first two, for sure, but it may be more prevalent. Big companies may be necessary to keep a high level of quality control for many of the products we buy, but churches that are run like big companies are increasingly seen as a detriment to spiritual growth, not an aid to it. That’s not the case for everyone (those big churches are filled with a lot of people, after all), but those who feel that way about big crowds are a growing majority, not a shrinking minority. Numerical growth can no longer be assumed to be the indicator of church health that it previously was. And if that’s the case, maybe smaller isn’t the problem we thought it was. The problem with the church isn’t lack of numerical growth. We’ve lost our first love. When getting bigger is more important than going deeper, we’ve lost our first love. When professionalism is more important than integrity, we’ve lost our first love. When tradition is more important than transformation, we’ve lost our first love. When buildings are more important than people, we’ve lost our first love. When infighting is more evident than unity, we’ve lost our first love. When protecting the powerful is more important than defending the weak, we’ve lost our first love. Our biggest problem is not how many people are leaving our church buildings. So getting them back or clumping them into larger groups won’t fix the problem. The problem is why they’re leaving. And the solution will only be found when we address those issues honestly, openly and contritely. Thankfully, we don’t need larger churches, better strategies, bigger budgets or cooler stages to find or fix that problem. We need genuine worship, true repentance, honest leaders, full accountability, moral integrity, loving hearts, deeper discipleship and a generous spirit. Any church of any size can do that. And in some cases, the smaller, the better.